Any cameraman provided by our company comes with the following complete camera kit. Tripod kit as standard for £25 per day. 5D MkII cameras for HD video - including range of fast Canon and adapted Nikon manual lenses (including 300mm f 2.8 Canon, and Series III IS 70-200mm L series Zoom, Nikon 14-24mm wide with Canon adaptor for TL - all great for Red Epic). O’connor 2060 cine head for long lens work. Sachtler 25p head, long CF legs, medium legs and baby legs/high hat. Mini Sungun, 3 x dimmable Dedo lights plus stands, LED mini panels. Extensive range of hides, rucksacks, cases and camouflage gear. HD Monitor. TV logic VFM –056WP. EASY RIG. £190 per week. A great tool for stable hand held work, Movi operation, or even just carrying the camera quickly from A to B. Set to take cameras from 10-14kg (Varicam etc) and from 7-10 kg (Movi rig with Epic etc.). Extension piece to keep Movi away from operator. The light is quite heavy (see video) but waterproof and cool and provides equivalent 1000W tungsten light with focusable beam and low power draw. The light can run off a deep cycle car battery, mains or a generator - and has the advantage that the light quality can be varied to match forest light with green hue etc. £240 per week. SPINTEC LENS RAIN DEFLECTOR. £140 per week. Ultra high speed spinning filter. Keeps water off the front of the lens for filming (or during time lapse). Works for even the most extreme rain or spray. Only suitable for use with fresh water (salt or calcium rich spray will streak as the thin layer evaporates). Will not fit lenses with filter size over 10cm so no HJ18 or HJ21. D tap powered. ABC100 CRANE. £600 per week. With bar to the platform head, minimising vibration for hothead. (motorised head and weights not supplied). In addition to standard kit it includes camera suspension attachments, tripod head mounting, attachments to angle the camera, and Canon remote focus control with optional Canon zoom control from operator end, making it flexible even without a hothead. VOCAS MB450 matte box set. Cased £250 per week. including attachment to receive 15mm bars support, 2 x 5.65” square trays, 2 x 4” x 5.65” oblong trays, donut light excluders, top and side shade attachments, and independent front-of-lens attachment for Canon HJ40 or HJ11 lenses. Also 2 x 5.65 square ND 0.6SE filters. 1 X 5.65 square linear Tru Pol. The legendary Leitz Apo-Macro Elmarit 100mm f2.8 3-Cam, Nikon mount, EOS adaptor, with the dedicated 1:1 Leica Elpro adaptor. Brings full frame macro to 35mm sensor at 30cm range, Nikon mount with PL option. Best for Epic and Alexa. Often cited as the best macro lens ever built, and the lens with which Leica calibrate the sharpness of their other lenses. £150 per week. Micro lenses and macro-glide including Zeiss Tessovar micro zoom (B4 adapted) and set of three Zeiss luminars with adaptor to fit B4 mount and via Canon and Nikon Bellows for extreme micro. Macro-glide. £300 per week for set. MODERN KL 2500 SCHOTT FIBEROPTIC COOL LIGHTLight source with broad cable bundle and focusing lens. 240V and inverter for 120V US supplied. Cased, £35 per day. 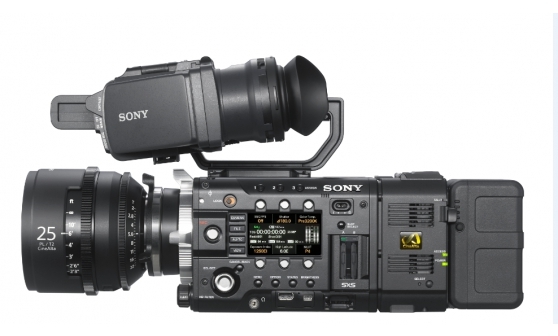 SONY F55 CAMERA Feature Film Spec! PAUL D. STEWART LIMITED , LITTLE PETHERICK, TROUTSTREAM WAY, LOUDWATER, RICKMANSWORTH, HERTS, WD3 4LA. UK. All images copyright Paul D. Stewart Ltd.